I am thrilled to be able to announce today (I've been keeping it quiet since Tuesday which for someone like me is hard) that I've been short listed to be a Heartmaker for The Body Shop. This means the world to me. When I entered the competition on Facebook I didn't think I'd stand much chance against the other entries but I adore The Body Shop and all the values it promotes so I gave it a go anyway. The email I received back on Tuesday told me I'd been shortlisted by the judging panel out of 1000s of entries which is a massive success on it's own. I couldn't stop grinning from ear to ear. I choose to apply for the 'ACTIVATE SELF ESTEEM' value as it's the one I feel the closest too. I know what it's like to feel ugly, feel like I have nothing to offer anyone and feel self-loathing constantly. I was a late bloomer purely because my self esteem was so low. I've come through that now and achieved things I never thought were possible by boosting my own self esteem. I really want to be able to help others activate their own self esteems because I truly do think that everyone has something to offer the entire world no matter how little they currently think of themselves. I'd be honoured and thankful if you could all vote for me on Facebook as this opportunity is something I would love to be able to experience. This is my entry that was shortlisted. The brief was to write a little bit about myself to explain my love for the value I applied for and then to design a 'postcard' for that value by choosing an image and coming up with a small amount of writing. 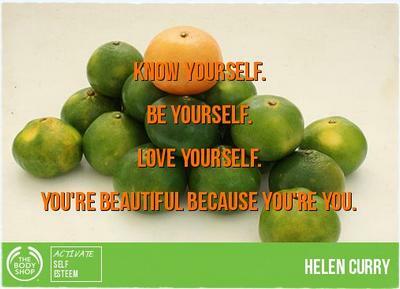 I'm super proud of it and I deliberately choose the image of the orange against the limes to further illustrate that everyone is individually beautiful. If you want to vote for me simply go to The Body Shop Facebook page and follow the directions to the voting and vote my postcard (which is the image and name you see above). I'm very happy to be short listed and deem this as a real success. I genuinely am so pleased but I would love to win too and would be very grateful if you could vote for me. It would genuinely mean the world! Well done!! I couldn't find where to vote though, is it not up yet?